Story mode is available in single player mode. 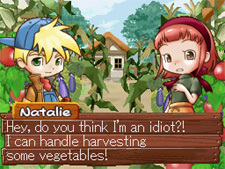 In story mode, you play as one of 12 Harvest Moon characters as he or she tries to discover why Sunny Island is being overwhelmed by crops. As soon as you pick them, they seem to grow back! When you first start story mode, you can choose to play as Mark or Chelsea. As you play through each person's side of the story, you'll unlock more characters and their own side of the story. Each story mode has about 7 rounds of play with cut scenes in between each round. The puzzle matches will either be Team Score, Team Crops, Score, or Survival. Sometimes you'll be playing against the other characters, and othertimes you will work together to finish the goal of the round. You can't skip the story outline that plays before each match. Playing through story mode once will unlock mission mode. This story deals with Mark looking around the island for the Witch Princess and Harvest Goddess, so that he may ask the two ladies why the crops are growing wild. Match 7: H. Goddess Pond field. Survival mode with Mark and Natalie against the Witch Princess. Chelsea runs around the island, gathering vegetables to help Wada repair the tower. They hope their efforts will stop the crops from growing. The day starts out as norma until the crops start sprouting uncontrollably! Natalie and Mark partner together, and then split up, to find clues to learn what is going on. Match 4: Town field. Earn 15,000 points before Julia, Elliot, or Chelsea does. There is no time limit. Match 7: H. Goddess Pond field. Survival Match against the Witch Princess. The Harvest Goddess wants to fix the tower, so she asks Wada to collect a lot of vegetables. He gives the tasks to Shea, who must run around the island collecting the crops for his adopted father. Really just trying to mind his own business, Vaughn ends up agreeing to help Chelsea collect crops so that Wada can fix the tower. Julia and Elliot meet up with the Witch Princess, who assigns them to find shining vegetables so she can fix the wild crops.